Kyeki-Hari, the Planetary Goddess of Kyeki II, was rather miffed with Charles’s presumption, even if he did save the place, it had been fine right where it was, Abyssal invaders or not! Now more than half the people on her planet were confused and upset, and they were all pestering her for answers! Why hadn’t Charles just run off the Abyssals if he wanted to intervene? Even an annoyed goddess could find little to say in the face of Charles’s casual assumption that moving the planet was a very minor thing, and far preferable to dealing with unpleasantness – such as an Abyssal takeover. It was almost impossible to out-understate THAT. Thus Charles, the Tsunami, Kyeki II, its defenders, and its satellites, some spacecraft scooped out of troublesome situations along the way and assorted other objects continued heading for Tarvail – leaving behind the areas where the influence of the Elemental Pole of Earth held strong for the realms where the influence of the Wyld was ever more-widely felt. The silly zones. In a cosmos with a radius of ten to the hundreth-power light years or so, some of those were very large indeed. Planetary natural disasters were really quite rare. The local gods usually kept things far better organized than THAT – but there was a distress signal from one world… a planet of pink swirling puffy clouds and a definite wyld influence… The cute, chirpy little voice was pleading for help. An asteroid had struck the world; as far as anyone knew the sun had been completely blotted out and had remained so for three days now! He was calling for help from one of the poles! And that definitely seemed to be true! The pink clouds were swirling over a large portion of the planetary surface – and over an enormous crater with a whole lot of rubble and fire, covering an even larger area, around it. The rest of the planet, however… was getting pretty cold! Warming things up, removing the mess from the atmosphere, repairing the land area, restoring normal atmospheric circulation patterns… The thaumaturgic display wasn’t as spectacular as Sorcery, or as a Charm of similar magnitude would have been, or even as conspicuous as it would have been in the Underworld – but it was still locally detectable when you were operating on that kind of scale – and it brought in some rather desperate prayers, from some of the small settlements on the world. It looked like it had been colonized about twenty years before – but from the prayers the planetary god had not been heard from in some weeks. Well, that was more fixing while Malinda checked on the Planetary God! The trail started at the god’s sanctum – where he was last seated a few weeks ago. There were faint traces of the workings of Celestial Circle Sorcery there, mostly around the doorway. Then there was a faint silvery radiance, reminiscent of Lunar Essence, going outside one of the poles – and up into space. The trail ended at a Wyld zone fairly close to the planet’s orbit, on a lonely, if bright fuschia, asteroid. (Charles) “Is.something wrong? Is anyone there? Hello”? There was an answer from the asteroid, over the comlinks – more cutesy voices. At that range the video links went into operation – and the locals were VERY fluffy, like sheep – but with big, soulful human eyes. She and Rufy did so. That was easy enough – and produced a rather fuzzy sensation running through his Essence, and some squeaking, like cloth being rubbed against a hard surface. The Great Puffle tried to open up – but there was some interference from warding. Nothing that Charles couldn’t easily push past though – which produced a quite literal ball of pink fluff with eyes. Woolstone? Ah! An artifact that… made things soft and fuzzy. Evidently a rather eccentric planetary god! He made one, and linked it to the Puffle, so that it couldn’t be taken away so readily. Huh! An ENTIRE WORLD as fluffy as his Teddies! Charles could not resist setting up a few manses to help the Puffle look after the fluffy things! Charles checked… would the Teddies like to visit there sometimes? It looked like… yes, they would. Some of the ones with more initiative were already asking! That was very good! And easy! He made sure that there was a gate, and someone on teddy-sitting duty, and that way if the fluffy world had any more problems he would find out straight away! The Puffle would apparently appreciate the traffic. For some reason, the only trade he really got was from clothiers and interstellar field trips from wealthy Tarvialian private academies. Some more tourism would be nice! Charles considered that for a long moment. The Puffle mulled that over for a few minutes. Elsewhere there was some incredulity. The boy had actually delayed his urgent mission to drop by and help out a world of cute fluffy things. Could he actually be delayed and steered to EASILY? It was difficult to believe! In fact, that was only half true… while all that had been going on Charles had been busily getting all the Overseers and Tenders linked up to manses that would help keep them from getting killed, setting up artifacts to take some of the support load off of them and let them get out of their pods, and assigning extra bodyguards of a variety of types to them… Hopefully running time faster in Aden would let him generate enough of them quickly enough to look after everyone! After all… at the moment, the quickest way to kill Yu-Shan would be a strike on the Tenders and Overseers! He had also been busily talking a Sidereal or two into visiting Nine Grape. Ms Chisaru was willing – which was good, since she was one of the few who knew what was going on already, had a lot of experience, and was currently helping out! There was no point in making a Synergistic Overmind to help you multitask and not using it! Charles installed some controls on the new Woolstone and headed on to Tarvail! It wouldn’t be all that much longer now. Traffic near the Wyld zones was already picking up – until, a few hours after leaving the World of Fluff, space shimmered with rainbow lights as ships fluttered in and out of the scintillating prismatic borders. Not that word wouldn’t get around anyway. Well, there were a variety of suitable systems available; Charles offered a selection – one that was mostly asteroid belt, which would be great for gathering volatiles, metals, and weird chaos stuff. There was another with a nice warm yellow sun and several gas giants with more volatiles and considerable scenic value (the astronomers on board insisted on taking a closer look). There was even a system with another habitable world on it, which might be good for expansion. 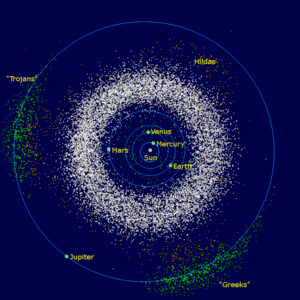 The goddess wanted the world with the yellow sun, while the planetary defense force wanted the asteroid belt system. Eventually the goddess won out. It was her planet, after all! Charles added a few asteroid belts while the astronomers were taking a closer look at the gas giants – photographing the delightful rings of one world, which shimmered in the colors of the Maidens. Not too near where Puffle was stuck but Charles waved cheerily, just in case. One of the astronomers looked a bit askance and said that he swore the yellow ring twinkled. He set up a few more wards, and protective manses to handle communications, extra defense, and to anchor the wards (some basic privacy-protections to prevent them from being too-easily located and some defenses) and headed on out. Everything Malinda could project said that they should be all right for the time being at the very least! It wasn’t much longer – after all, they were within the same galaxy now – before the Tsunami reached the most heavily trafficked system Charles had yet seen: there were both natural and artifical Wyld zones, constructed on planetary moons. The ring of one gas giant shimmered with them. And, visible through divination, was THE Tarvial, an extensive array of defensive satellites and space stations surrounding it. Cities surrounded its high mountains, delicately-preserved forests and plains. Its Wyld zones were… practically airports, from the looks of the scrying survey. The Tsunami was hailed about the time she crossed the system’s outer belt. Her ship was a military cruiser, its Wyld drive shimmering and glowing with gossamer spurts. The Tsunami docked herself; she didn’t tire, but it was nice to sit for a bit after a long trip! It was mostly Tarvialan military personnel wanting to talk with Charles about his having moved Kyeki II; they were mostly pretty incredulous at the scale of the thaumaturgy. It wasn’t exactly subtle, and at least one patrol ship had seen it happening during its patrol. (Charles) Well, they weren’t being at all nice! Charles cheerily had one of his aspects in Aden call the United Heaven and Worlds party while he went to have a look. The engineering compartment was incredibly cramped – but several of the personnel seemed to recognize him, including the head engineer, who had hands where his feet should be and wanted to shake lower hands – which seemed reasonable enough! Hmm…. A minor artifact (**) that protected the ship it was when going through Wyld zones and ensured that the journey always took a much shorter amount of time than it would take to cross the same space normally. Pretty much a weaker form of the Lunar interstellar Charm tree. Well, upgrading it a bit (to ****) would only take a few minutes and would make it nicely self-contained and much more efficient! There was some awe and quiet whispering as the engineers observed the process.